Blackberry pie for breakfast is an annual late summer treat. Cooking in the summer for me is a funny combination of quick, whatever I have on hand because I don’t want to be sweating over a hot stove meals, and on the other hand, making more laborious, involved things that I only get to make once or twice a year because the season is fleeting and precious. And somehow sweating over a hot stove for hours is part of that fleeting pleasure and experience that makes it what it is. And it’s often done in the name of preserving that treasure for the cooler months so it’s time extra well spent. The past few weeks have seen lots of the former and a few of the latter. Blackberry pie, though not terribly time-consuming is in the latter category. I just don’t make pies that often and blackberry may be my very favorite. It manages to evoke the feeling of hot summer afternoons picking blackberries in the woods–dusty, sticky sweet and all scratched up–in one single bite. I use an all-butter crust (this is a good recipe) and about 6 cups of blackberries, 3 tablespoons cornstarch, juice of one lemon and maybe a little lemon zest, for this summer treat. 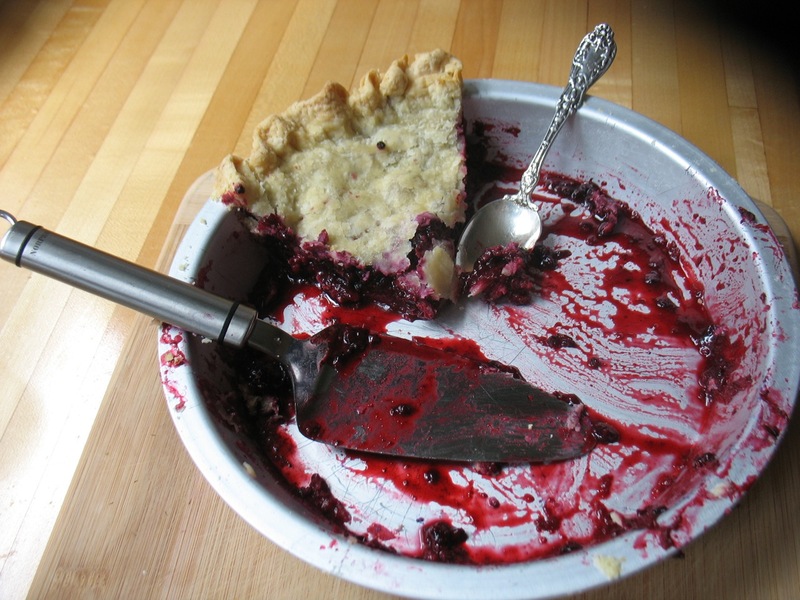 And if you make a blackberry pie, leave it out over night (covered with a dish towel) and don’t refrigerate it. In the morning you’ll have the best summer breakfast imaginable waiting for you. In the slow and hot department, I’ve made lots of jam this year: raspberry, strawberry, marionberry peach vanilla, blackberry, peach vanilla, and blackberry fig lemon. I’ve approached jam with a cook-with-what-you-have (and desperately need to use up before it goes bad) attitude. Thus the blackberry fig (Dolores thank you for both!) and marionberry peach. It’s been fun, hot and sticky and I can’t wait to give many of these jars away come the holidays. In the quick department, it’s been tomatoes and more tomatoes these days. Oh and a beet salad that’s worth briefly noting. I tossed chunks of cold, roasted beets with avocado, green onions, cilantro, feta and a bit of lime juice, olive oil and salt. It was an impromptu lunch but will certainly turn into a planned affair in the future. 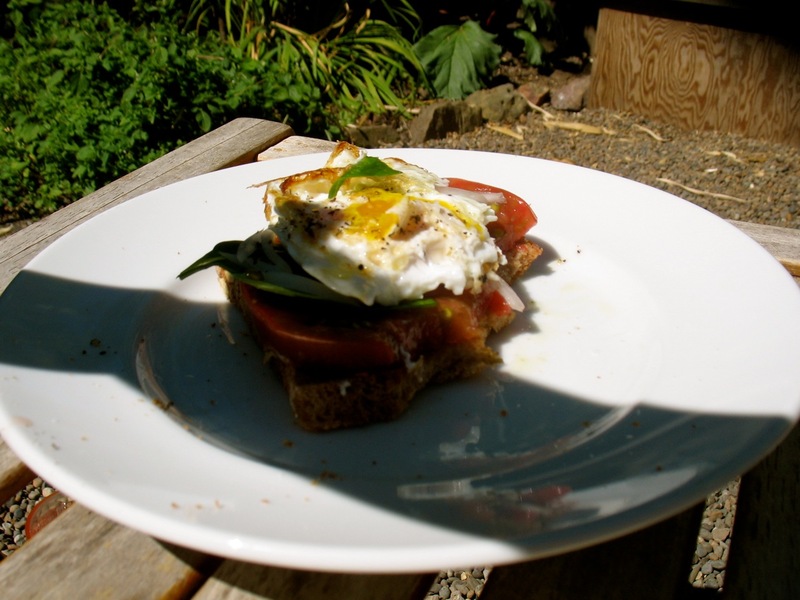 Fried egg on a slice of tomato, some basil, a few slivers of sweet onion, butter, a good pice of toast and topped with some basil and salt and pepper! Divine! And finally, my new favorite tomato dish, that I made for dinner last week and will make again, at least once, this week. It’s a brilliant, quick combination of simple ingredients. I got the idea and only slightly changed the recipe from Deb at smittenkitchen.com who only slighted adapted if from Ina Garten. Their versions call it Scalloped Tomatoes but because there is no milk or cream in it, which I think of when I think of scalloped anything, I’ve started calling it a Tomato Bread Gratin. But no matter, it’s really good. 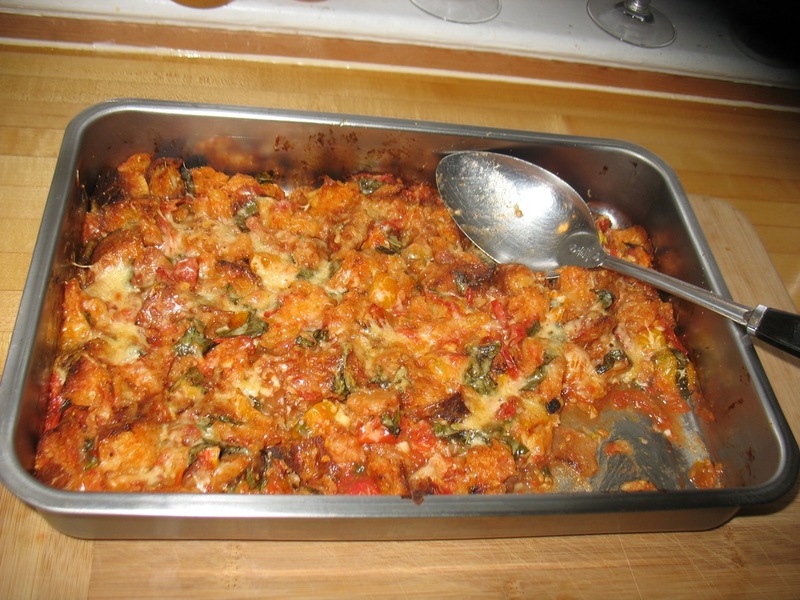 Tomato Bread Gratin–a quick, hearty but light summer dish that is much lovelier than this lackluster photo conveys. –adapted from smittenkitchen who adapted it from Ina Garten. You can vary the quantities and ratios here with no problem. More tomatoes will make it a little moister and might take a little longer to cook and more bread will make it denser and more crisp. I used less cheese than the original(s) listed and loved it. You can vary the herbs and increase the quantity if you’d like. 1/2 cup (or more) grated Parmesan or other hard cheese. Preheat oven to 375 degrees. Butter a 9 x 13 baking dish or other shallow dish. Toast bread cubes in a large skillet with the olive oil over medium-high heat, stirring regularly, until the bread is toasty. Add the diced tomatoes, sugar, salt and garlic to the skillet with the bread and stir really well to incorporate evenly. Cook for about five minutes, stirring often. Take off the heat, stir in the basil and pour contents into baking dish. Top evenly with parmesan and bake until bubbly and crisp on top, about 35 minutes. Serve with a big green salad or other summer salads. This is, as Deb at smittenkitchen suggests, fantastic with a fried or poached egg on top. P.S. Now that school has started I’m gearing up for fall classes. Lots to choose from here at Cook With What You Have including the next two classes that take advantage of all this fabulous, late summer/early fall produce. So come take a class and enjoy these fleeting treats with some new ideas.